Looking for alternative to expensive medications? How about moving away from chemical based solutions that instead of healing you, it makes you feel worse? You've heard the side effects of taking drugs and capsules: it kills your organs, makes your feel weak, and make your immune system low. But the Doctor says you need it. Isn't ironic how something that should makes you better ended up destructing your health? Well, now you have a choice. You can go for a pharmaceutical made product or go for natural alternative solutions. If you want your body to thank you in the future, go for the latter. 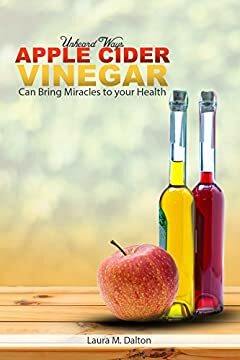 Apple Cider Vinegar has been discovered to do miracles with regards to health. It is organic, raw, unfiltered, with the 'Mother' (Naturally Gluten Free - Certified Non-GMO) known to prevent and cure several diseases. Now that you have an idea what can Apple Cider Vinegar do to your life, the next thing you should do is buy this book. Inside, you can get a step by step procedure on how you can get a specific outcome. Things like increasing metabolism, losing weight, having a flawless skin and overall health advantages of taking this organic solution. I will even suggest the brand that you need to look into. An ounce in a bottle of Bragg USDA Gluten Free Organic Raw Apple Cider Vinegar everyday could make wonders. You don't have to do the guesswork, I did it all for you. Find about the secrets of this dynamic miracle cure. Get this book, and start taking care of your health... naturally. ***You don't need to own a kindle to read this, mobile phone, computer, tablet and laptop could work too.